Taree Off Road celebrates 27 years in 2017. Chris and Maree Temple purchased the business 25 years ago, they could see a market for 4wding on the Mid North Coast of NSW, when the business was then located at 35 Crescent Ave. As the business grew they moved across the road to 44 Crescent Ave, then in 2010 Taree Off Road relocated to the current address at 26-28 Oxley Street. This new site has given Taree Off Road the room to expand, not only in the showroom but the workshop area as well. Chris and Maree’s previous experience includes running Ozcraft at Forster which led them to start their own business Temple Fabrications at Gloucester. At Taree Off Road we have a qualified, experienced and friendly team that can offer you sound advice when it comes to all sales and installation of all four wheel drive parts and accessories. We are dedicated to supplying you with top quality 4WD parts and accessories, that won’t let you down on your next four wheel drive experience. We specialise in all 4×4 accessories for your vehicle. At Taree Off Road we have an extensive range of four wheel drive accessories and if it’s not in stock, we will do our best to get it for you. 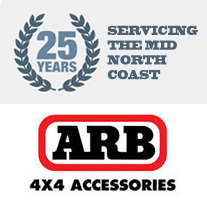 We are proud to be an ARB Stockist as ARB has been at the forefront of Australia’s 4X4 Accessories Industry for over 40 years. We have a large range of outdoor camping gear, perfect for that weekend or extended holiday. We are an authorised dealer and fitter of Hayman Reese products. Whether you need a towbar for your car, 4wd, van or light commercial vehicle we can fit your vehicle for trouble free towing. Hayman Reese have an extensive range of weight distribution systems, sway controllers and electric brake controllers to compliment the complete towing system that takes the challenge out of towing trailers, caravans, horse floats, boats and camper trailers. If you are planning your next 4wd adventure, make sure you drop in and see us for all your 4wd equipment and advice, whether you live in Bulahdelah, Nabiac, Gloucester, Forster, Tuncurry, Port Macquarie, Taree, Wauchope, Laurieton, Kempsey or surrounding area’s call us for a quote today. Having the right equipment will give you peace of mind on your next outdoor adventure. We can also assist you with pre-trip checks on your 4wd. Don’t get lost on your next trip! We stock a great range of Hema Maps and Books as well as Hema HN7 & HX-1 Navigators. Would like to get accessories fitted to your vehicle and you live in the Forster-Tuncurry area? We can arrange free pickup and delivery of your vehicle. Come on in and say hi and have a browse in the show room – you never know what you might find!